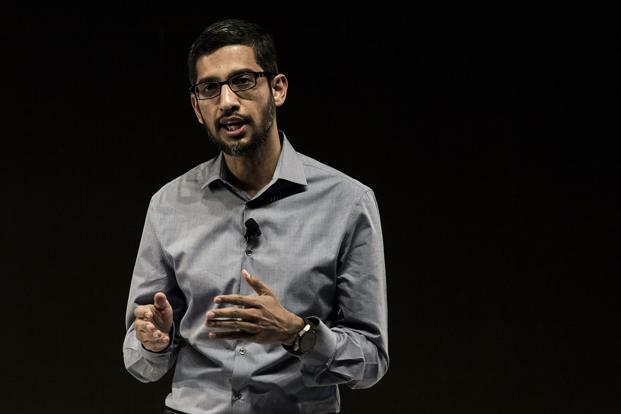 New Delhi: Sundar Pichai is reed-thin, like a marathon runner. Soft-spoken, hair unfashionably short, cropped with a severe side parting, a hint of grey in his beard, his appearance complements his curriculum vitae: a degree in metallurgy and materials science from Indian Institute of Technology-Kharagpur, followed by a master’s in engineering from Stanford University and another in business from Wharton School of the University of Pennsylvania. And, of course, now the top job at that company, Google Inc. He has a sharp, piercing look that is offset by a ready smile that could be a reflection of what he thinks about the question or that he is really delighted to talk about the subject. Artificial intelligence, for instance, seems to be something that he is passionate about and Google is using that in TensorFlow, its open-source platform for machine learning. He could be a physics teacher at a Chennai college (judging by the number of times he uses a physics metaphor to illustrate a point, he would have enjoyed being one.) When he gestures, you notice he has worked his fingers off—so long and bony they are. You know within minutes of a first interaction with select editors in Delhi that this is a thoughtful man, not a sharpshooter. When an editor introduces himself as a senior from IIT, he asks for specifics—which batch, which campus and then proceeds to give a colourful description of the latter’s hostel. For someone who has spent nearly two decades in the US, he retains a strong south Indian accent that dovetails perfectly with his refusal to write off India or accept suggestions about the country’s infamous inability to foster innovative products like, well, Google. He explains patiently that India is at the take-off point with enough people connected to the Internet to offer the kind of market viability the US offered start-ups back in 2004 when Google was born. “Constraints”, he remarks a trifle dramatically, “inspire creativity”. It’s a thought. He talks about a recent book he read on the Wright brothers which talks about how concerned people were when the first bicycles came about, of young people riding far away from their homes! For a man who steered some of the iconic Google products like Chrome and Android, there are no limits. So, with the zeal of an evangelist, he talks about the potential of payment systems to fuel business in India. Imagine if you could transfer money from people to people and people to businesses, with the ease that people exchange messages. So, what will Sundar Pichai do next? At 43, he is atop the corporate world, the most powerful chief executive in technology and among the most influential in the world of business. A recent missive on the need for tolerance, issued in the context of Donald Trump’s anti-Muslim remarks, attracted worldwide attention and drew widespread support. His next job could well be as a global statesman, so adept is he at steering conversations and disarming people. But the ‘nice guy’ image that Pichai has may be deceptive, for mostly he manages to steer people around to his point of view.